The Setting. Posted by The Game Master. 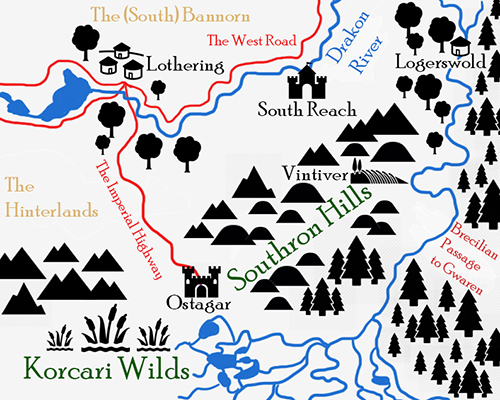 South Reach is an Arling in Southeastern Ferelden. Traditionally, the Arling falls under the leadership of the Bryland family. However, Arl Gareth Bryland rebelled against the invading Orlesian forces and when their conquest of Ferelden was complete in 8:44 Blessed, the Arl was put to the sword. His only heir and daughter, Alicia Bryland, was only 9 at the time. South Reach fell into the hands of Marshall Jacques Chevin, the commanding officer assigned to the Arling. Chevin was a practical man and knew that in order for his Orlesian forces to keep the favour of the South Reach populace, he needed to allow the deceased Arl’s only heir and daughter, Alicia Bryland, remain in power. To legitimise his role as ruler of South Reach, he married Alicia when she was of age and together they have two children, Leonas (Born 8:74 Blessed) and Eliane (Born 8:80 Blessed). Though Chevin was a loyalist to the Orlesian campaign, he understood the need to learn and accept Ferelden customs. Over time, Chevin earned the respect amongst the majority of the people in South Reach, and rebel activities were generally few and far between. Under his rule, the town of South Reach blossomed into a fortified capital, law was enforced and businesses flourished. Despite being under Orlesian rule, people were actually happy in this backwater Arling. In 8:95 Blessed, Chevin was severely injured in a hunting expedition. Though he recovered from his wound, his health was never the same and he passed away a year later. Orlais immediately sent a replacement, Marshall Reynaud Rosfort, who disapproved of Chevin’s ‘soft-handed’ approach and was quick to assert his will and show the populace who was in charge. Under his rule, the iron-will of Orlais has been enforced. Unhappy with this change, Chevin’s heir and oldest son, Leonas Chevin, who now styles himself as Leonas Bryland ran away from home to join Prince Maric and his rebellion. The new Arl has placed a bounty on his head and placed Alicia and her daughter, Elaine, under house arrest. Here are the laws of South Reach as of 8:97 Blessed, under House Rosfort of Orlais. -	Slaves, indentured servants and peasants are prohibited from bearing arms (exceptions such as knives, walking staves, hunting bows, farming tools etc. apply) unless authorized by the local magistrate. -	All magic users must carry a license issued by the Circle of Magi, and no magic is allowed within walls. Any offenders caught, will be punished and reported to the Chantry. -	Report Apostates! No exceptions. -	Any information regarding Ferelden Rebels can be reported to your local ruler or to Knight-Commander Deveraux in the South Reach Barracks. -	A reward of 100 gold pieces is for anyone who has information or helps apprehend known rebels. A reward of 500 gold pieces is for anyone who has any accurate information about the traitor, Leonas Bryland. 1000 gold pieces for accurate information on the whereabouts of Leonas Bryland and 5000 gold pieces for bringing him back dead or alive. Once a small settlement along the West Road and Drakon River, it is now a fortified town with a population of approximately 6,000 thousand people. Under Marshall Chevin, the town’s fortifications have been improved to include stonework along the wooden palisade. Many of the wooden homes within the castle grounds have been upgraded to stone cottages and the majority of the townsfolk have access to wells. The town boasts of a newly refurbished Chantry church, a town barracks led by Knight-Commander Deveraux, a town militia led by Captain Bernard, a lively market square and even a theatre The Chevin Hall that stages famous Orlesian plays and conducts regular classes in a bid to impart Orlesian culture and education to the Fereldens. But most famous of all is The Dragon’s Nest , a three story Inn that boasts of food, drink, gambling and rooms for rent. Lothering is a small village that sits along the Imperial Highway and the Drakon River. The river bisects the village into two. To the south of the river is the most prominent and largest building of the village, the Chantry. It is headed by Reverend Mother Abella and the Templars are led by Commander Ser Gerome. To the north lies the market square with the Victory fountain in the centre, small shops selling sundries, the tavern-inn Dane’s Refuge, the home of Elder Mariam and the caravan grounds. Ever further north, on the outskirts of the village are a number of farmsteads. During the Second Orlesian Invasion of Ferelden, at the Battle of Lothering, King Vanedrin Theirin is killed and Calenhad the Great's sword, Nemetos, is lost. Before the king's death, Ardal Cousland, Teyrn of Highever, is slain defending his king. A victory fountain was erected to commemorate the victory of Orlais in Lothering. It is a prominent feature in the centre of the market square and depicts a statue of a proud golden lion as bright the sun standing over a fallen silver wolf. Nestled in a shallow vale between the hills of Southron Hills, the rolling hillocks and elevation of the land is well suited to the village’s primary crop – grapes. Vintiver is made up of about two dozen homesteads, each with its own garden plot, where the locals grow their own food. The vineyards extend further up the hillsides, outside of the village proper, and there are a number of outlying farms considered part of Vintiver, but located a mile or more away from the centre of the village itself. In the centre, a Chantry temple, a smithy, a winery, The Arbor Inn and stables, and the Warden’s cottage can be found. Because each family is largely self-subsistent, there isn’t any market in the village and travellers who stop by, mostly just want to buy grapes and wine. Located at one end of the Ruswold Valley, Logerswold exists almost entirely to support the logging industry that brings lumber out of the Brecilian Forest and transports it west into the flat, open, tree-poor Bannorn. Only a few dozen families call Logerswold home. More Ruswold freeholders live in the surrounding area as farmers and craftsmen of various types. Although they are all hardy Fereldens, they are not a particularly martial people and are prone to suffering attacks from bandits, the denizens of the forest and rebel attacks. As such, Chevalier patrols within these parts are heavier compared to the rest of South Reach, especially since wood is of particular importance to the ongoing war effort. The two most prominent log cabins in Logerswold is the local chantry run by Sister Pliacinth and Sign of the Spreading Tree, an alehouse that sits in a compound owned by Trewin the Logger. Standing at the edge of the Korcari Wilds, Ostagar is a testament to the reach of the ancient Tevinter Imperium. It is here that the Imperial Highway comes to an end, and so does known civilization. The fortress has the Chasind from the fertile lowlands of the north, being exceedingly difficult to attack due to its naturally defensible position. Like most southern Imperial holdings, Ostagar was abandoned after Tevinter's collapse during the First Blight. It was sacked from the south at least once, but the Chasind threat has dwindled since their defeat by the hand of Hafter after the Second Blight and no troops have been stationed the area for centuries - though most of the walls still stand, as does the Tower of Ishal which is named after the Archon who ordered its construction. Today, it is manned by a force of Chevaliers and Ferelden conscripts. However, little to no action is seen in recent years.